The Mad Max White Polishing pads are engineered with a special type of light colored resin which minimizes and discoloration or streaking when polishing lighter colored stone and engineered stone. The Mad Max LDT Slient Granite Blade is engineered with Linear Diamond Technology. Mad Max 4" polishing pads are velcro backed and color coded for easy identification. They can be used on granite, marble and concrete. The maximum RPM is 5,000. Mad Max 5" polishing pads are velcro backed and color coded for easy identification. They can be used on granite, marble and concrete. The maximum RPM is 5,000. Mad Max Standard Turbo Cup Wheels featuring Turbo rim configuration for fast clean grinding and aggressive stock removal. The ADW Epic Turbo Dekton blades are made in Spain and specifically designed for use on Dekton and other ultra hard compact materials. Sale price good through 4/30. This Mad Max 1-3/8" VBB Power Drill is ideal for drilling holes in granite, marble and stone. Sale price on VBB Core Drill with 5/8-11" Thread good through 4/30. Diamax Cyclone Diamond Cluster Grinding Wheel is perfect for wet grinding application including surface preparation and edge shaping applications. Diamax Cyclone Ultra Fine Fiber Cup Wheel features fine diamond grit gives you chip-free grinding. The Diamax Cyclone Side Segment Turbo Blade features side protection that is completely inlaid within its core. This 6" Electroplated Tile Saw Profiling Blade is excellent for use on a wet tile saw for edging marble and other stone materials. This 6" Metal Tile Saw Profiling Blade allows for clean, professional contours for marble and granite. 8" Metal Bond Tile Saw Profiling Blade, 3/8"
This 8" Metal Tile Saw Profiling Blade is excellent for contouring marble and granite. The Alpha® Wet Core Drill Bit is designed for drilling the faucet-mounting holes in counter tops and vanities. 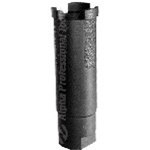 Alpha Professional Tools® introduces a Dry Core Bit designed for use on the job site without using water. Alpha 4" Ceramica EX Polishing Pad polishing pad works extremely well on all natural stones. The Alpha 5" Ceramica EX Polishing Pad polishing pad works extremely well on all natural stones. Designed for wet use, these high performance discs provide the best possible professional polish on the curved edges of granite. Alpha Professional Tools is excited to introduce the Alpha Katana. 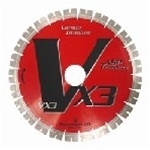 This blade is the ultimate dry cutting diamond blade for the professional tile contractor. This Alpha VBB 1/2 Profiler is designed for large foot print 1/2" thick floor tile application. 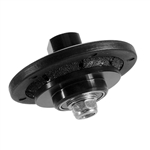 This Alpha VBB 3/4" Profiler Router Bit is designed for creating round over on 2cm and 3cm slabs. The Alpha VBB 3/8" Profiler Router Bit is designed to produce 3/8” roundover on granite, marble, engineered stone, porcelain tile and slab. 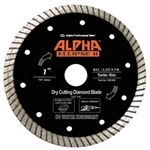 Introducing the Alpha® Profiler V40, a unique wheel designed to create a bullnose edge profile that will eliminate the time-consuming calibration process. 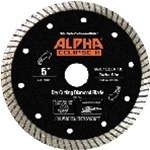 In order to shape the edge to a desired profile, Alpha® introduces the Profiler Z-Series, Vertical Grinding Wheels. Dewalt DW4764 10-Inch Premium Porcelain Tile Blade features an extended performance diamond matrix that provides long life and enhanced material cutting. Dewalt 4" 10 TPI T-Shank Jigsaw Blades for wood cutting. 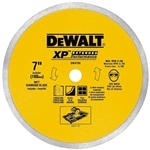 Dewalt DW4765 4-1/2 Inch Premium Porcelain Tile Blade features an extended performance diamond matrix that provides long life and enhanced material cutting. The Dewalt DW4777T 5" XP Turbo Diamond Cup Wheel has high diamond concentration for long life and aggressive material removal. Dewalt Diamond Tile Drill Bits provide a quick, clean way to precisely drill through the densest, most-abrasive tiles, including glazed ceramic and rock-hard porcelain. Diamax 4" Cyclone ES White Resin Polishing Pads are ideal for polishing natural and engineered stone. Diamax 4" Cyclone R Series Wet Polishing Pads are ideal for polishing granite, marble & engineered stone. Diamax 4" Hurricane Dry Polishing Pads are specially formulated adhesive keeps the pad together even under high heat. Diamax 5" Cyclone R Series Wet Polishing Pads are ideal for polishing granite, marble & engineered stone. An upgrade from Diamax's regular T-segment with diamond side protection on outside and inside shaft for ease of drilling and core release. The Diamax Cyclone High Speed Silent Core Blade is the fastest cutting silent blade. 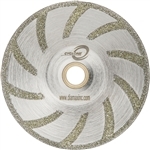 The Diamax Cyclone Glass Blade is a wet cutting diamond blade for cutting glass tile. Diamax Cyclone Hex Flat Resin Cup Wheel has flat 90° surface that allows for corner shaping and grinding and features a more aggressive grit than the Cyclone Flat Resin Cup Wheel. Diamax Cyclone High Speed Silent Core Blade - 18"
The Diamax Cyclone Porcelain Tile Turbo Porcelain Blade features a new bond for the fastest cutting porcelain blade on the market, and with an element in the rim, the blade never heats up. 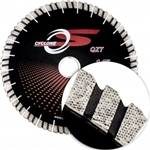 The Diamax Cyclone S Quartzite Silent Core Blade is ideal for cutting quartzite and the hardest stones. Diamax Cyclone Ultra Dry Thin Wall Core Bit has specific grit & bond composition that provides a fast clean hole through porcelain & other ultra compact material.